Everyone loves a good sugar cookie. They’re really amazing for decorating, because you can put candy or coloured sugar or even a paint on them, and you can use cookie cutters or a knife to create different shapes. 1. In a large bowl, sift together flour and salt. Set aside. 2. Use an electric mixer on medium-high speed to cream butter and sugar until fluffy. Beat in eggs, vanilla, and salt. Continue to mix on medium-high speed until just combined. 3. With the mixer on low speed, gradually add the flour. Mix until just combined. Remove the dough, shape into 2 discs, and wrap in parchment paper. Refrigerate 2 hours. 4. Preheat oven to 350oF. On a floured surface, roll dough to 1/4 inch thick. Cut into desired shapes (scraps can be balled up, refrigerated, and used again). Transfer to ungreased baking sheets lined with parchment paper; refrigerate until firm, about 15 minutes. 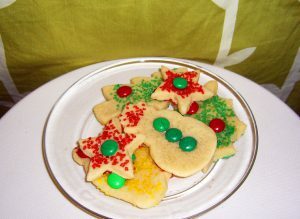 Remove from refrigerator, and decorate with sanding sugar, if desired. Bake until edges just start to brown, about 15 minutes. Cool on wire racks. May be stored at room temperature in an airtight container for up to 2 weeks.